cPanel is the most popular hosting Control Panel these days. But that does not imply that it is the best - it has lots of flaws and it has had them for so long that they are no longer considered flaws by the majority of users. But only because something was OK in the year 2000 doesn't imply that the same thing will be okay now. With Hepsia, you can administer your site, domain and billing very easy, from a a single location. With cPanel, you have 2 separate Control Panels - one for your website and another one for your invoices and domains. With Hepsia, each domain has its own independent folder. With cPanel, you have 1 main domain folder and all other add-on domain names are located inside it. After some recent updates, cPanel's File Manager works and looks much better. Nevertheless, it offers neither drag-and-drop file upload functionality, nor archive/unarchive functions. With Hepsia, you get multiple free-of-charge extras. With cPanel, the cost-free extras you obtain depend on the web hosting packages provider, which suggests that you can also receive a bare-bones cPanel with nothing else. 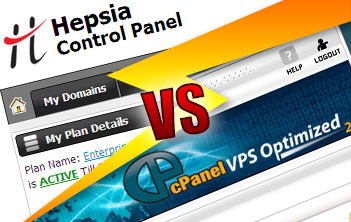 Tests have demonstrated that the Hepsia web hosting CP is 3 to 5 times faster than the cPanel hosting Control Panel. While with the The cPanel web hosting Control Panel you can get the work done, it's based on ideas from the year 2000 and can be sluggish at times. Administering ten different web sites with the Hepsia web hosting CP is not harder than administering one or two web sites. Hosting more than ten web sites under a single cPanel account is indeed hard. The Hepsia web hosting Control Panel lists just the most essential sections on the home page and you can navigate using drop-down menus available in all of the sections. The cPanel hosting Control Panel displays all available icons on the home page. To move between sections, you invariably need to go back there. The Hepsia web hosting Control Panel features a full-fledged demo account with just a couple of functions disabled. You can even build an entire website and see how it looks like prior to deciding whether or not to register. The cPanel hosting CP offers a bare-bones demo, which will only offer you a vague idea of what the cPanel web hosting Control Panel can do. This list can carry on and on. But instead of simply reading about these web hosting Control Panels, why don't you give the Hepsia hosting Control Panel a go with our Live Demo and discover for yourself how easy website hosting can be?